To wash out rust and iron stains from white clothes, simply add Red-B-Gone Rust & Iron Stain Remover to the wash with the detergent. Step 1 Add 1/2 cup to warm water in washing machine. Step 2 Add clothes - let soak 5 minutes. Step 3 Add detergent - start wash/rinse cycle. Red-B-Gone heavy duty rust remover can also be used as a presoak for those stubborn stains. Step 1 Presoak garment in a well mixed solution of 1/2 cup Red-B-Gone to 5 gallons of water. Step 2 Wash cycle as usual. To use Red-B-Gone on rust-stained dishes and glassware, just soak in a solution of 1/3 cup Red-B-Gone per gallon of cold water. Most stains disappear in 10 to 15 minutes without rubbing. To clean dishwashers and washing machines, add one-fourth to one-third cup of Red-B-Gone to an empty machine and run through a normal wash cycle. Red-B-Gone Rust & Iron Stain Remover will dissolve rust stains from sinks, tubs, shower stalls and toilet tanks and bowls or anywhere rusty water causes unsightly deposits. Step 1 Wet the discolored area and pour on enough Red-B-Gone heavy duty rust remover to make a thin paste. Step 2 Leave standing for five minutes prior to scrubbing. Step 3 Rub this paste into the spot or stain with a damp cloth, small soft brush, or other non-abrasive scrubbing aid. Step 4 When rust spots are gone, rinse the area thoroughly. Repeat if necessary. 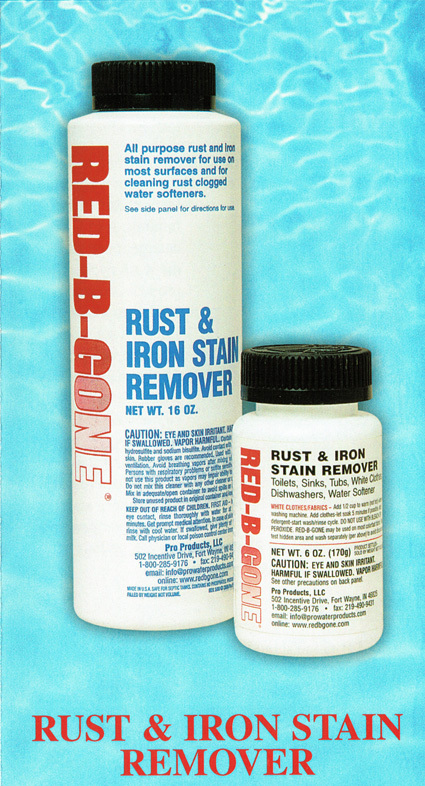 Use Red-B-Gone heavy duty rust remover to remove rust and iron stains on fiberglass, china, vinyl, porcelain, cement, and aluminum surfaces. Red-B-Gone Rust and Iron Stain Remover is excellent for use under windows and around exposed nail heads. Also use Red-B-Gone on aluminum siding, concrete driveways, sidewalks, near rain downspouts and door steps. Red-B-Gone gives swimming pool liners a "new" look - use only when pool is drained for cleaning and flush thoroughly after use. Make stained gel coat surfaces on boats look like new with Red-B-Gone - do not use on chrome or stainless steel boat hardware and fittings. FOR SMALLER AREAS, wet the surface and pour on enough Red-B-Gone heavy duty rust remover to make a thin paste. Let stand for at least 5 minutes. Rub paste into the spot with a non-abrasive scrubbing aid, then rinse thoroughly. Repeat if necessary.